Caffé Reggio in Greenwich Village is high on my list of nontraditional, non-touristy things to do on a Saturday morning in New York City. 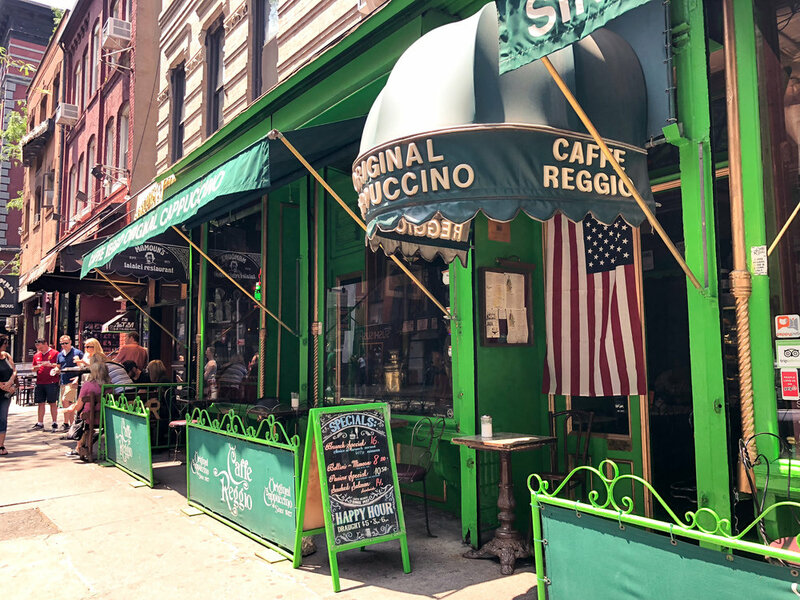 The coffee shop has nearly a century of history on MacDougal Street, including the credit for bringing the original cappuccino to the United States. When the server placed the mug in front of me I clapped like a toddler who just learned a new trick. I can confidently say that my almond cappuccino from Caffé Reggio was the best I've ever had. I haven't had an espresso drink with real dairy milk in years, but the original cappuccino was a worthy treat to break my non-dairy promise. The foam was smooth and sweet, while the almond syrup added gentle flavor. Plus, the nutmeg sprinkled on top gave off an aroma that always reminds me of homemade donuts. When the woman at the table across from us got up to leave, she stopped by our table to say she was so glad someone else had the same reaction to the cappuccino as she did. Caffé Reggio is a full-sensory experience. I took in the dark setting while sipping my espresso drink. The natural light peaking through the windows keep the place quiet and warm. The tables are mostly mismatched vintage, unlike the new trendy coffee shops erupting on every corner. I sat on a gorgeous wooden bench that I later learned far predated the cafe's opening. Antique and vintage are the theme here. It seems that every surface of the Caffé Reggio walls are covered with Renaissance-style art, but they're not just in the style of the Renaissance, they're authentic. A dramatic 16th century painting from the school of Caravaggio and an antique bench which once belonged to the Medici family bearing the Florentine crest of the illustrious Medici family are among the works that impart a feeling of grace and warmth to Caffe Reggio. The original espresso machine made in 1902 claims a prominent spot in the cafe and it's as much a work of art as the tapestries surrounding it. This press clipping from a 1945 issue of The Herald Tribune shows the machine with Caffé Reggio's original owner, Dominic Parisi, before "barista" was a widely used term. Beyond it's fame for the original cappuccino, Caffé Reggio has also earned plenty of on-screen time in film and television. A Findery user notes that it appears in The Godfather II, In Good Company, The Pallbearer, and Shaft, among other films. According to my Instagram sleuthing, we'll also see Caffe Reggio in the upcoming season of HBO's The Deuce. It's a favorite spot for writers, artists, and celebrities, too. It's also worth mentioning that the cafe is across the street from Louis May Alcott’s former townhouse, so if the coffee doesn’t inspire you, the neighbors might. I'm still daydreaming of a Greenwich Village apartment within walking distance of the best cappuccino I've ever sipped, but until then, I'll just make it a regular stop when I find myself wandering MacDougal.